Which Vacuum Is Right For Your Hardwoods? 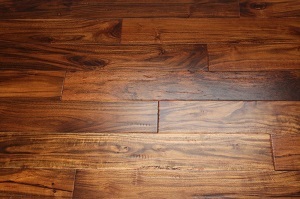 Hardwood is among the most beautiful flooring you can put down in your home. If properly maintained it will not only look stunning but will also last for a very long time, perhaps longer than any other type of surface. In fact it is not uncommon for a traditional solid 3/4 inch style to last for up to 100 years or more, but there are many factors that affect that. The fact of the matter is your hardwood floors are an investment that you want to take care of. Besides the occasional refinishing you will want to keep your hardwoods free from dirt and debris by delicately vacuuming them. It is essential to not use spinning brushes or a beater bar as these will scuff up the surface and cause premature wear. A brushroll is really only necessary when using on carpets, to agitate and pull up embedded dust mites or pet dander from deep down in the fibers. When you are using a vacuum cleaner on a smooth surface like tile, laminate, or wood this is not necessary. You need to find a model that gives you the ability to turn the brush off with the simple push of a button. Even though you are keeping the surface free from dirt on a regular basis, other things like oil and grime can build up. You will need to do more than a simply sweep or vacuuming to completely remove this. Make sure to use a safe product that is designed specifically for wood cleaning (carefully read the instructions). Try not to leave any standing water on the surface as this can damage the hardwood, and remove any excess cleaning liquid as soon as you are finished. This will bring out the shine and help protect the floor from the everyday traffic that travels over it. Now that you know how to keep your hardwoods clean, which vacuum is the best choice for these types of floors? A canister vacuum cleaner is perfect for hardwood flooring. It is typically outfitted with multiple attachments and is light enough to pull around without leaving marks on the floor. 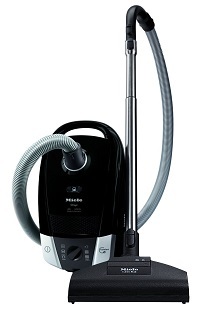 When it comes to vacuums, Miele is really a company that stands above the rest. Their Compact Series is just right for this application as they come with their Protective Parquet Floorhead with no brushes, built to cover a wide area without marking up the surface at all. This attachment works well on all types of smooth floors. Powerful suction and a unique airflow design is all that is needed to pull everything up on the first pass. Another important feature of the Miele Compact Series is their AirClean™ filtration system. It consists of 3 components: 3D Efficiency dustbag, pre motor filter, and exhaust filter. They all work together to keep the airflow sealed up tight, so any dirt or microscopic dust particles cannot escape back into your home. The bag seals up as soon as you remove it so nothing can escape. This is crucial to not only getting your floors as clean as possible but also for keeping the air quality high inside your home. For more information and to read online consumer reviews, click here to visit our recommended supplier. Depending on the size of your home, you might not need the size and power of a full sized canister or upright vacuum cleaner. Another excellent choice for vacuuming hardwood floors is the Dyson V8 Absolute, a battery powered cordless model from a company known for innovation. It is completely cord free and comes with a lithium ion battery that not only holds its’ charge for up to 40 minutes but also doesn’t fade as it gets close to being drained. The result of this is steady performance throughout the entire time you are cleaning. 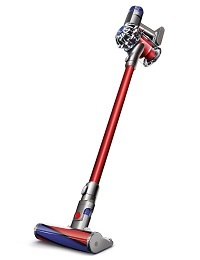 The most unique feature of this Dyson is the fact that it can be used as a handheld or upright vacuum. Simply remove the extension and floor tool, and then put the correct attachment on for whatever job you need. You now have a powerful handheld machine that is portable enough to take out to the car to get your seats and carpeting looking like new. Very few cleaners have this type of versatility. For hardwoods or really any other type of smooth flooring (and even low pile carpets), the Dyson Absolute is a terrific choice. The cordless design is unique, and the fact that you can quickly convert from full sized to handheld mode makes it capable of handling any surface in your home. For additional information and to check current pricing, click here to go to our recommended ecommerce store.